Housing finance has been a sweet spot in India. Growth in housing credit in India continues to outpace overall credit growth by a robust margin. That is why housing finance companies (HFCs) have prospered and gained significant market share from banks over the past few years. However, HFCs were badly hit by the liquidity crisis that engulfed the NBFC sector in September last year. For the smaller ones, it’s a question of survival. Stock prices have nosedived, and investors have shunned HFC stocks. But “in the middle of difficulty lies opportunity,” quipped Albert Einstein. This is a perfect time to separate the wheat from the chaff and look for opportunities to invest in businesses that have weathered the storm. 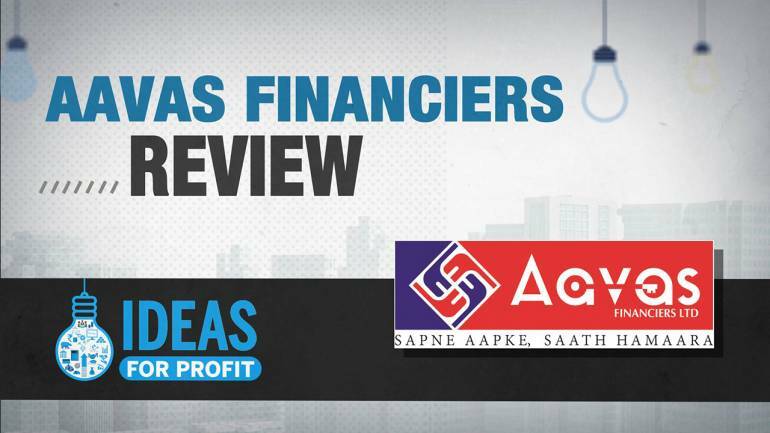 Aavas Financiers (CMP: Rs 1,145, market capitalisation: Rs 8,900 crore), a mid-sized HFC, is a company that not only managed to raise equity at the peak of the crisis in October last year, but has flourished during this challenging period. The company reported robust growth in loan assets and more than doubled its profit from a year ago in Q3 FY19. Thanks to such a strong performance, the stock is up a breathtaking 90 percent from its low hit last October. The obvious question, of course is: should investors buy into the stock after such a strong rally? Yes, in our view. Sure, liquidity might be a problem for the sector, but Aavas’ business model continues to remain strong. Before getting into financials of Aavas, let’s take a closer look at the affordable housing finance segment. Affordable housing (mainly loan ticket size up to Rs 15 lakh) is the fastest growing segment for HFCs and is set to become a large business for them over the next few years. Though banks are also present in the smaller ticket home loan market, their lending to the economically weaker section (EWS) and low income group (LIG) without any formal income proof is limited. That is why HFCs are trying to tap into this underserved market segment. Before 2012, affordable housing was largely being served by a few lenders, such as GRUH Finance, Dewan Housing Finance and Repco Home Finance. But in the last three years, there have been 28 new entrants into housing finance, most of them focusing on affordable housing. Many new players (such as Aspire Home Finance, Aadhar Housing Finance and Mahindra Home FInance) have emerged in this business. Doesn’t that mean the sector is overcrowded? The liquidity crisis has led to a weakening of competition (e.g. Aadhar, a subsidiary of Dewan Housing) and in some cases due to piling up of bad assets (e.g. Aspire, a Motilal Oswal subsidiary). Aavas has emerged as an outlier in the overcrowded affordable housing finance segment. Aavas’ Rs 5,283 crore loan portfolio as at December-end grew 49 percent year-on-year. What’s encouraging is that growth has been volume driven and less reliant on expansion of average ticket size. Average ticket size is around Rs 8.5 lakh and the management intends to maintain it around similar levels (Rs 8-10 lakh). What is most comforting is that it has zero exposure to developer or land financing. The company avoids lending to customers directly linked to agriculture and dairy activities as their cash flows are highly volatile. Such superior credit underwriting policies and detailed analytics along with strong collection practices have helped Aavas build a relatively low-risk loan book with gross non-performing assets (GNPA) of 0.6 percent as at December-end. The company’s portfolio vulnerability remains high, given that a significant chunk of its loans is to self-employed customers, as cash flows of borrowers in these segments are highly volatile. Despite this, we expect low credit losses, given the secured nature of lending, and moderate loan-to-value ratio at origination. With most properties being self-occupied and the company being covered under the Securitisation and Reconstruction of Financial Assets and Enforcement of Securities Interest (SARFAESI) Act, it can auction of the properties to recover its loans. 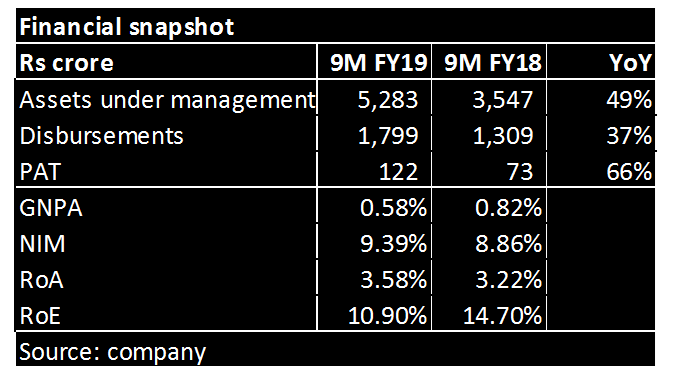 Despite the high growth, Aavas has been able to generate superior profitability with return on assets (RoA) of 3.6 percent in the first nine months of FY19, mainly supported by healthy net interest margin (NIM) and low credit costs. Aavas has more than adequate capital, which increased further following its initial public in October last year where it raised Rs 400 crore in fresh capital. Due to excess capital, return on equity (RoE) is depressed at around 10.9 percent as at December-end. However, leverage will improve as the company scales up the business, thereby increasing RoE. 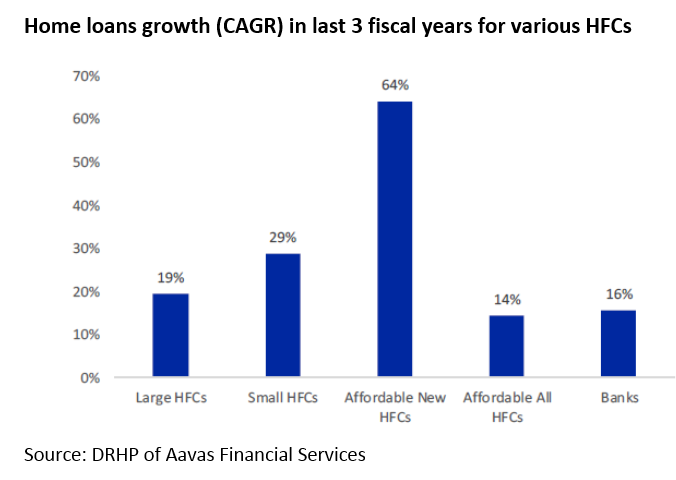 Can Aavas’ loan book continue to grow at its current pace and will high earnings growth sustain? The affordable housing segment is likely to continue to grow at a very high rate over the long-term. Rising urbanisation, increasing nuclearisation of families and improving affordability is converting latent demand for affordable houses into a commercially lucrative business opportunity for HFCs. Several initiatives by the government (interest subvention scheme, tax incentives, Housing for All by 2022, infrastructure status accorded to affordable housing, Pradhan Mantri Awas Yojana) along with regulatory push (priority sector status and lower risk weights on small ticket size loans) will further expand growth in this segment. Rating agency ICRA estimates that the total loan book of players in the affordable housing segment stood at Rs 1.64 lakh crore as on June 30, 2018. This means that despite its high growth, Aavas’ loan book is still around 2.5 percent of the overall pie. That is why we believe its loan book can grow at more than 35 percent per annum, especially when the competition stands weakened. While concerns that delinquencies can rise as a flipside to the high growth is valid, high lending yield in the segment (above 12 percent) is expected to offset higher credit cost to a large extent. Overall, we see high earnings growth sustainable on the back of Aavas’ vantage positioning and strong growth potential in the segment. Another big question for investors: Is the premium valuation justified, the high earnings growth notwithstanding? Affordable housing financing business requires feet on the street and evolved risk assessment processes, stringent underwriting norms, agile monitoring and superior collection mechanisms. With the usage of technology and analytics, Aavas has succeeded in creating all of these and build a superior franchise with a significant competitive advantage. Following the sharp rally, the stock is currently trading at FY21 estimated price -to-book (P/B ratio) of 3.9, which is at a significant premium to most HFCs. Given its strong earnings growth potential and ability to generate RoA above three percent, its premium valuation should sustain. While there is little room for a re-rating of the valuation multiple, the company will maintain its high earnings growth trajectory in the near term, which will drive the stock price. The risk is that its steep valuation doesn’t leave much room for the lender to falter on growth or on asset quality. While the rich valuations demand caution, the business’ unique moats make it an attractive holding among Indian HFCs. Investors should look out for price corrections to buy into the counter.